Hayzlett strikes upon a perfect Web 2.0 (or is it 3.0? I keep losing count) discovery. In the age of sound bites and channel surfing, the notions of the 30-second elevator speech and the five minute sales pitch have been radically altered. According to Hayzlett, well known for his imaginative social media campaigns, today you have no more than 8 seconds to hook and 110 seconds to reel someone in. That’s a little less than two minutes. Hayzlett calls it your “118.” If for nothing else, I recommend you buy the book to learn the tricks for creating a killer 118. Developing a solid 118 is only the first step to keep your business off life support. That’s where the concept of The Mirror Test comes in and where the incessant baritone of George C. Scott’s Patton reverberates in my skull. Hayzlett has an eloquently simple premise: Your business is like a shark in water – if it’s not moving, it’s dead (or dying). Using the “118” as a starting point, he takes you on a journey he believes every business must pursue – and uses his failures (including his failed pheasant farm) with humorous precision to make his point. (He doesn’t shirk on his successes, either.) Like Patton’s army and excrement through fowl, a successful business must keep advancing. The Mirror Test is not a chalk board book. You know what I mean – the kind where the coach draws all the X’s and O’s and tells you exactly what to do, when to do it and how to do it. Neither, on the other hand, is this book a mere pep rally, full of banal platitudes that everyone already knows – the satisfying sizzle that ultimately leaves you empty and hungry. Rather, you can best liken The Mirror Test to the half-time speech. It’s motivational, but it also suggests some specific strategies you can (and, Hayzlett insists, you must) employ immediately. In terms of full disclosure, I’ve met Jeff Hayzlett several times in the last year as part of the Rochester, New York social media network. I know a little bit more about him than the average bear; hence, my interest in his book. But – and this is important – before I met him I didn’t know who he was. Sure, he had a high profile position at Kodak and, yes, he had appeared on Trump’s Celebrity Apprentice. But, had I not made an effort to join the local social media network, I would never have known Jeff. This, in fact, confirms both the success the book promotes and serves as a warning to the book’s promotional success. 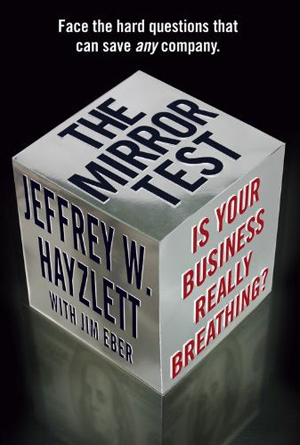 In order for The Mirror Test to climb the charts – and I honestly think that’s what Jeff wants – he’s got to show he really is a marketer on the broadest of scales. Without the leverage of a Fortune 500 company behind him, this is where we find out if Jeff can go beyond the intimate – though useful – lessons of South Dakota and confirm his style and strategy can produce acclaimed success. If it does, the book rockets up the best seller lists. If it doesn’t, well, just consider me one who enjoyed reading the interesting thoughts and fascinating personal stories of a friend.